Budding healthcare apprentices have completed their first step on a new programme which is encouraging people to advance into healthcare assistant roles in GP surgeries across the borough. The students from Barnsley College celebrated finishing the two week induction of the Primary Care Apprenticeship Programme on Friday 22 July 2016 at Barnsley College’s Open Kitchen. Students on the induction had access to specialised training, such as First Aid, Customer Service and GP computer systems training, to give them a head start when they begin working in their job role. 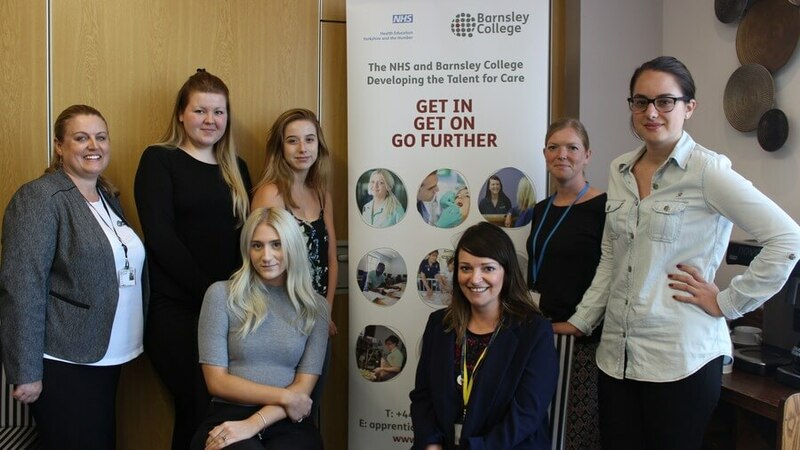 The Primary Care Apprenticeship Programme is a new initiative by Barnsley Clinical Commissioning Group (CCG) and Barnsley College to address the way jobs and skills needed in the NHS are changing in places such as GP surgeries. Apprentices enrolled on the programme study a Level 2 Business Administration apprenticeship and then progress onto the Level 3 Business Administration or Level 3 Health Care Assistant apprenticeship, depending on which area they would like to study. For more information about the range of apprenticeships and training courses available at Barnsley College, contact the Work Based Learning Team on +44 (0)1226 216 166 or email apprenticeships@barnsley.ac.uk.